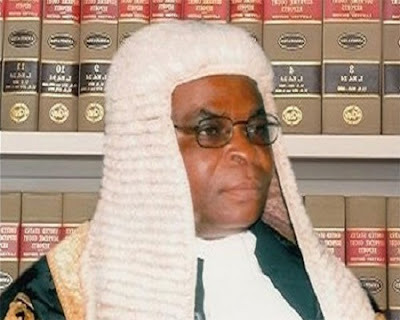 Proceedings at the Code of Conduct Tribunal (CCT), in the case against the suspended Chief Justice of Nigeria (CJN), Justice Walter Onnoghen has been brought to an abrupt end to allow temper to seamer in view of the hot exchanges between tribunal Chairman, Danladi Umar and lead counsel for the defence, Adegboyega Awomolo (SAN). Trouble started when the tribunal Charman insisted that proceedings must continue despite agreement, by lawyer to the prosecution, Aluyu Umar (SAN) and Awomolo, that the case be adjourned to a later date in view of some recent developments in the case. Rather than rule on the joint position presented by lawyers to the parties, the tribunal Chairman insisted on proceeding to hearing pending applications. While Awomolo stood up to appeal to tribunal Chairman to consider the position presented by lawyers to the prosecution and defence, for an adjournment, Umar ordered Awomolo to sit down. He accused the defence lawyer of encouraging delay and waste of time, observation Awomolo objected to and told the tribunal Chairman that it was wrong to say such things about him. While Awomolo spoke, complaining about the way the tribunal Chairman described him, Umar said he was not bothered, but was only interested in continuing with the case. At that point, the prosecution lawyer sought for a short stand down, which was granted.